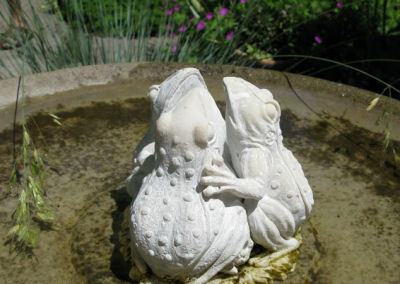 These Garden Frogs add A Touch of Whimsy to Any Garden or Home decor. Everyone seems to love frogs. That is a given. They seem to show up in all sorts of garden and home decor decorative accents. 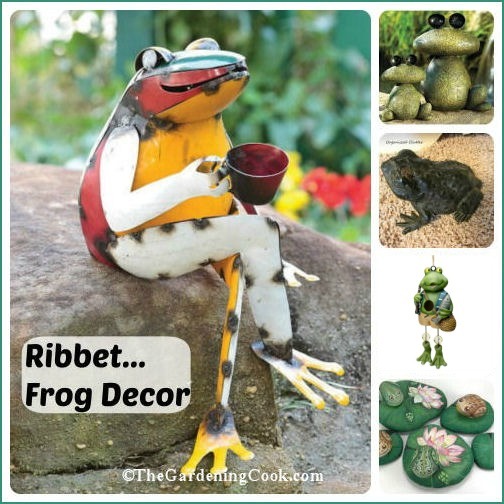 Whether your frogs are the DIY kind, a one of a kind creation or one that you have discovered as a great retail purchase, these amphibians will delight kids, both young and old. Here are a few of my favorite garden amphibians. Some are DIY projects. Some feature rocks as the groundwork and some are just plain cute. 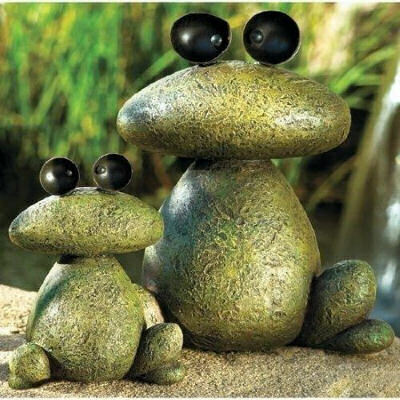 Gather some appropriate sized rocks and paint them green and black into frog shapes. When they are dry use an E6000 glue to assemble them into these frog shapes. Just adorable! Source: Imgur Oh my gosh, how cute is this idea? 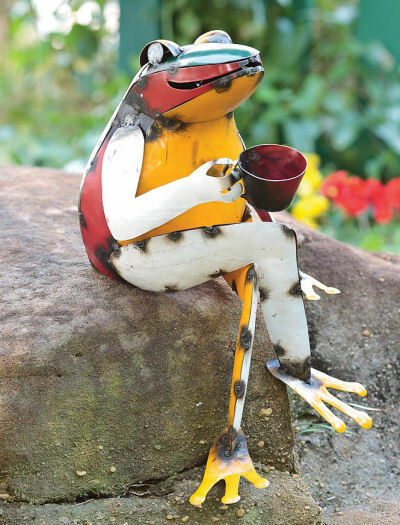 This eye catching recycled metal coffee can Frog garden sculpture is sure to make you smile. Wherever you seat him, indoors or out, he is sure to be a great conversation starter. Available from our affiliate partner Plow & Hearth. 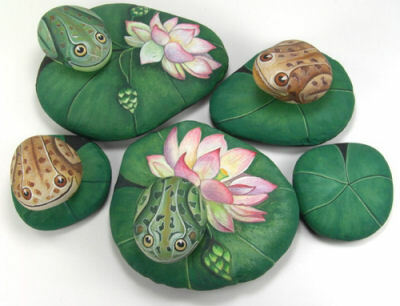 Ernestina Gallina, an Italian artist has made this collection of hand painted rocks that look like frogs on lily pads. Aren’t they adorable? You can view a gallery of her other wild life creations on her Etsy Shop Living Rocks. This adorable frog birdhouse is so whimsical. He is all dressed up for a fishing trip. Hang him from the trees in your garden! 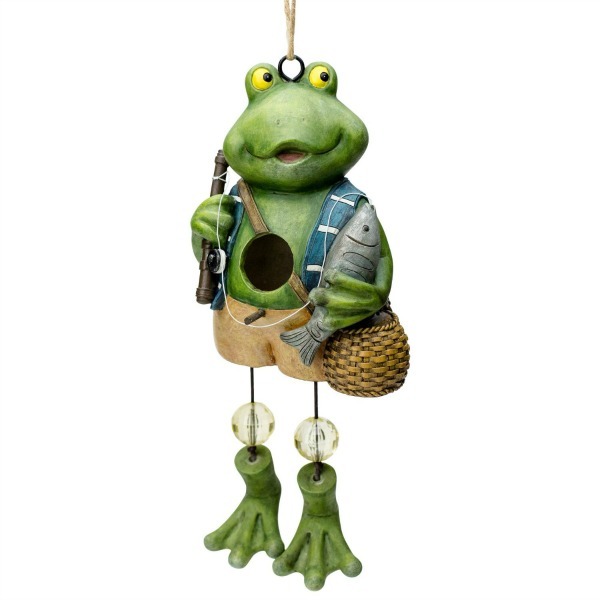 This frogs bird house is available from Amazon. 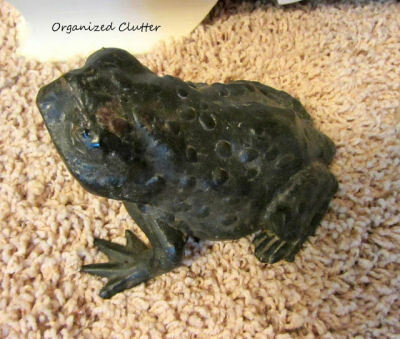 My friend Carlene from Organized clutter has this cast iron Frog door stop, which was made in Japan featured in her “Just Ducky” master bedroom. He used to live outside her front door, but seems right at home inside the house. Have a look at her bedroom. It is so neat! Melissa from Empress of Dirt recently did a garden tour and wrote about it on her site. 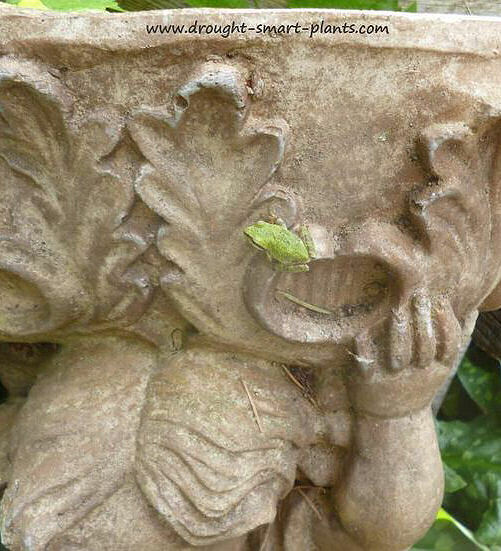 One picture that really spoke to me is this one of the ceramic frogs in this birdbath. So neat! See more of these gardens at Empress of Dirt. 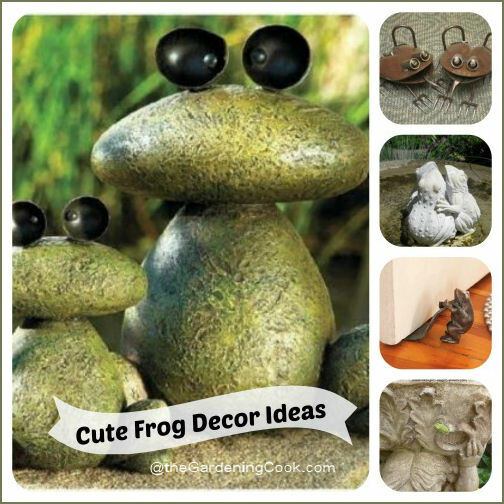 What collection of frog decor would be complete without a real frog or two? Jacki from Drought Smart Plants uploaded this image to Pinterest. The tiniest of decorations on a cherub’s planter; this frog is barely one inch long, and bright green. Do you think he realizes that he stands out like a sore thumb? 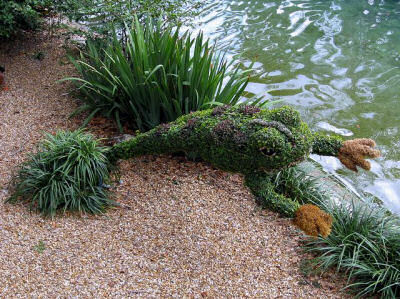 This amazing Frog Topiary is from the Bird Gardens area of Busch Gardens Park. Source: Flickr. Re: the green/black frog rocks. What did you use for their black eyes? 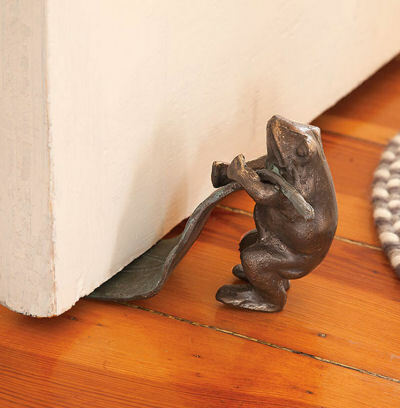 I can’t find the cast iron frog door stop anywhere! It doesn’t show up on Plow & Hearth (where you note it is available). Do you know where I can find this?